The preparation consists of unique mixture of plant and other natural extracts in 2% ethanol with no added man-made substances. 100% natural product for corals and salt water fish, showing wide-spectrum antiparasitic, antibacterial and antiviral effect. The preparation consists of unique mixture of plant and other natural extracts in 2% ethanol with no added man-made substances. As regards to the animals in everyday reefkeeping practice - except fish parasitic diseases - it is very complicate to determine the type of disease and its aetiology. 100% natural product CS CoraSound Multi was developed from very beginning as an animal-safe and 1st-choice preparation for salt water fish and coral with no need of precise determination of their disease type. CS CoraSound Multi application makes no sense if water in the tank is not perfect as regards to the chemistry and physical parameters! Especially in case of unclear aetiology diseases of hard corals its absolutely necessary to link the product application with seawater chemistry and physical parameters checking and subsequent remedy. We are not only talking about the concentrations of commonly measured elements and substances (Ca, Mg, Alkalinity, K, phosphates, nitrates etc.) but in case of hard corals also concentrations of Strontium and Boron are essential. The bath is prepared in a clean glass or plastic container in the volume corresponding to the animal treated - 1-3 litres in most cases. The container is filled with seawater - not with newly made, but always taken from the tank the animal is coming from. CS CoraSound Multi is then mixed in the water in the amount of 10 - 50 ml per 1 litre of water resulting in ca 1-5% solution. 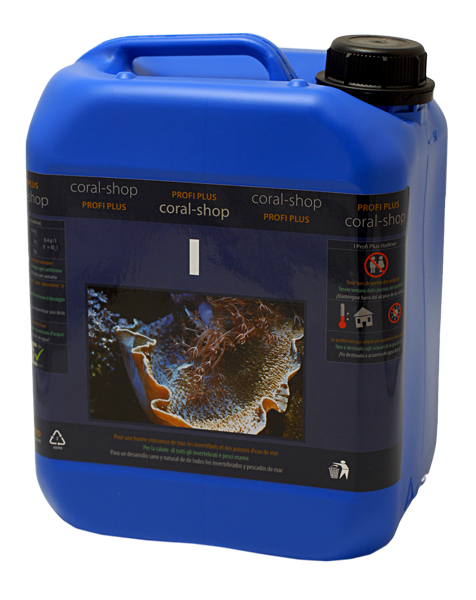 In general we use 1-3% solution for fish and 3-5% solution for corals. We let the animal in the bath for about 5-25 minutes. In general 5-15 minutes for fish and 15-25 minutes for corals apply. Especially the fish behaviour has to be observed carefully and in case fo any negative response fish has to be returned to the tank without delay. The bath should be repeated 2 - 5x - always with one-day pause between applications. Approximately 15 minutes before releasing the animals into the tank CS CoraSound Multi is added into the sachet in the amount of 30 ml per 1 litre of water (3% solution). CS CoraSound Multi can be regularly applied into the tank for general prevention - especially in the case when there is no ozonizer and UV-lamp present. Maximum daily dose for this purpose is set on 2 ml per 1.000 litres of water daily. It is strongly recommended to apply the preparation with precise dosing pump and avoid one-shot - for example weekly - cumulative doses. In many cases reefkeepers prepare the food mixtures according to their own know-how. Such mixtures may contain many diferrent ingredients - frozen food, live food, seaweed etc. The chronic problem is always the lifespan of such mixtures, even kept cooled for regular manual application, not talking about automated dosing. CS CoraSound Multi can be used as 100% natural and animal-safe preservative in such cases. Recommended amount of CS CoraSound Multi is 5 ml per 1 litre of food mixture. CS CoraSound Multi is and always will be an experimental product and the manufacturer cannot bear any related warranties. The user of the product always bears all risks related to the product application.